Mainly found on lawns and other grassy areas in the plains. They are a very common lawn mushroom most of the summer. Agaricus arvensis stains Yellow slightly. A rather large mushroom with the cogwheel veil. 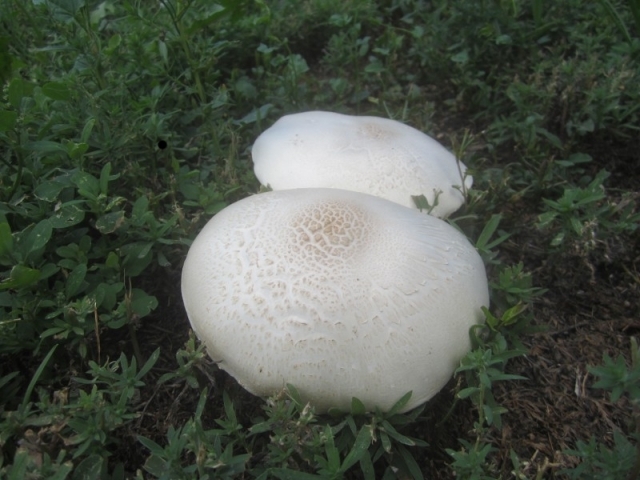 They are larger than most other Agaricus species found on lawns. They are very similar to Agaricus sylvicola only it grows in the city on lawns rather than in the woods. Both mushrooms show a cogwheel veil and look nearly identical in appearance. Agaricus sylvicola however turns more of a golden brown with age and smells more almond like.